Well that didn't take long. April was my first post and here I am already behind. Geez, even I am amazed by my slackiness. So what brings me back? My grandma died. I love my grandma. She was one of the few constants in my life. Both of my grandparents served as an inspiration for me. Their love and personalities had a clear influence on the type of person I have become. I try to model myself after my grandpa's clear and tough outlook on life and my grandma's unwavering nature and generous personality. 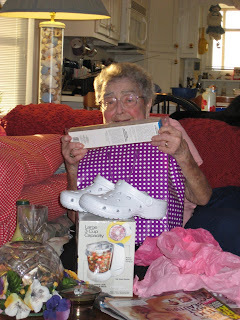 Growing up, Grandma was always there to add a little joy to my life. She would send cards with $5.00 for almost every holiday without fail. Halloween, Valentine's Day, Thanksgiving, Birthdays, Anniversary, etc. ; I could always count on a card from her. It would brighten my day and offer a much needed foundation to my life. Christmas was her favorite time. Grandma's "goodie bags" became legendary in our family and were the most anticipated part of Christmas morning. She would spend all year gathering random items and surprises that she knew we would like and place them in a large burlap bag. They were never expensive items or luxurious, just little things that you knew she picked out just for you. She also included a $50.00 bill in each bag with a small bank envelope that framed the president so you could "buy something you'd like." I once told Grandma when I was 15 that I liked a certain candy called "Sixlets." After that, I got a package of them every year in my bag. It was little personal things like this that would remind me how much my Grandma loved me, no matter how far I lived from her or how often I visited. When I got older and Grandma couldn't get around as well, I took delight in being able to repay all of the care that she had shown me. I loved buying her surprises and little presents because she took so much joy in receiving them. I loved being able to run errands and fix things around the house for her because she genuinely appreciated it. Our roles had reversed a little and it was my turn to spoil her and we both enjoyed it. Grandma has had some tough times in the last few decades. When my grandpa died, it was heartbreaking. I can only say that I hope my own marriage will live up to the love the two felt for each other. Grandma was sad, but she never gave up living. She stayed busy and maintained the life they had started together. In 1996 when Hurricane Fran washed away the house they lived in for 17 years and all of the mementos they had collected through out their lives, Grandma mourned again. But she didn't give up. She moved to Rose Hill and began the process of rebuilding. There was never any question as to if she would live on the beach again, even though her neighbors and friends all sold their properties and moved on. Grandma was going to rebuild and start over at age 70. That spot on Topsail Island is where her husband took his last breath. It's where his ashes were scattered. It's also where her daughter-in-law's ashes were scattered. Grandma was determined not to leave that spot. So as she reached her 80's and could only walk down the ramp to get her paper and mail once every two days, I began to worry that time would win out over Grandma's determination. She couldn't stand up longer than 30 minutes at a time and she had long ago stopped walking down her back steps to the beach. I kept thinking it was ridiculous that she lived by herself in a house so ill suited for someone in her condition, but I kept my thoughts to myself and I did what I could to help her stay longer. Grandma never let her health get in the way of living her life. She adapted to each difficulty with walkers and medical alerts, with loud tv's and orthopedic pillows. I'll never forget the last time I visited her. She asked me to take her car for an oil change and inspection sticker. When I brought the car in, I checked the mileage. 36,000 miles on a 7 year old car. She hadn't driven the car in a year, but she knew the inspection sticker needed renewing and she wanted it done. This was my Grandma. She was not going to let old age stop her from living her life. My dad called me late Sunday evening and told me that Grandma was going to the hospital in an ambulance. I was surprised because I had spoken to her on Saturday and she had said she was doing fine. But apparently Sunday morning she woke up feeling strange and shaky. My aunt spoke to her on the phone and decided to spend the night with her and take her to the doctor on Monday. But after spending some time with her she decided that it was best to go the hospital right away. At 2:20 AM, I got a phone call from my sister telling me Grandma had had a stroke and was in a coma and on life support. The doctor's didn't expect her to make it through the night. My dad was on the way to NC and they would call if anything changed. I didn't sleep much that night. I got up early and got ready for work. I wasn't really sure what to do. At 7:45 AM I felt a wave of sadness wash over me and I cried for the first time. I didn't know it at the time, but my Grandma had just died. I went to work and around 9:00 AM my dad called and let me know that Grandma had passed. I spent the next 12 hours working and getting ready to leave for the rest of the week. Grandma was to be cremated and have her ashes spread over the same stretch of ocean as her loved ones. There were some difficulties in finding a pilot and plane capable of making the illegal flight to spread the ashes and it was decided that the three grandsons would spread the ashes. 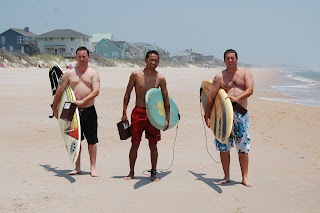 We were to paddle out on surfboards, past the breakers, and spread the ashes in the ocean. Walking into the ocean with a surfboard under one arm and my Grandma's ashes in my other hand was surreal to say the least. This is what she would have wanted. The waves were choppy and there was no clear line of breakers. It was difficult. At one point after paddling and getting pounded by waves, my worse nightmare occurred. A wave crashed into me and washed away the plastic container I had tucked between my chin and surf board. I quickly turned and started swimming back towards the box. I caught it about 15 feet from the coast line. Exhausted, I turned back once more to try and swim out into the water and join my cousins. I struggled for what felt like forever, but finally made it far enough out that the waves were only breaking at the tips. My cousins and I were spread out, but we yelled out each other to start the process. We opened the boxes and let the ashes free. Surprisingly, they didn't swirl around like I was afraid of, but dropped cleanly into the water. I sat on my board and watched as they dissipated through out the water.We sat there for a little while and then paddled back in. I was completely spent. There is a picture my uncle took of the three of us walking back and I look like I'm smiling. I'm not, I'm wincing. I realize now how the burial was fitting. It was fitting of course, that she be buried in the ocean she loved so much, along side the people she loved so much, by the people that loved her so much. But it was fitting that our final chore for Grandma was a struggle. A testament to the love we felt for her. A testament to her struggle to live by herself on the beach she loved so much. A testament to how well she taught us the life lesson to never give up, no matter how hard the task may be.